Check out our top new release romance picks for August 23 2014! To Catch a Thief. . .
For centuries, Gideon Montrose has served the King of Fairies without question and, often, without mercy. So when the King orders him to apprehend a notorious thief, Gideon obeys. But when he finally gets his hands on the beautiful culprit, Gideon's in for a shock. Arabella Locksley is none other than the spirited, unpredictable woman he knew back in Make Believe as Robin Hood--the love of his life whose tragic death destroyed his chance at Happily Ever After. Now, he has an impossible choice. Betray the woman he once loved, or the king he's bound to serve? Ever After by Kate SeRine is a new romance title from Kensington Books, released August 21 2014 and available from Amazon and Book Depository. Investigator Tristan Bonnaud has one aim in life - to make sure that his half-brother, George, can't ever ruin his life again. When Lady Zoe Keane, the twenty-one-year-old daughter of the Earl of Olivier, shows up demanding that the Duke's Men find a gypsy woman, Tristan seizes the chance to hunt for his gypsy horse trader friend, who might know secrets about George that he can use against him. But along the way, Tristan discovers unexpected Keane family secrets, but will they stop him from falling for the woman who will risk all to discover the truth. 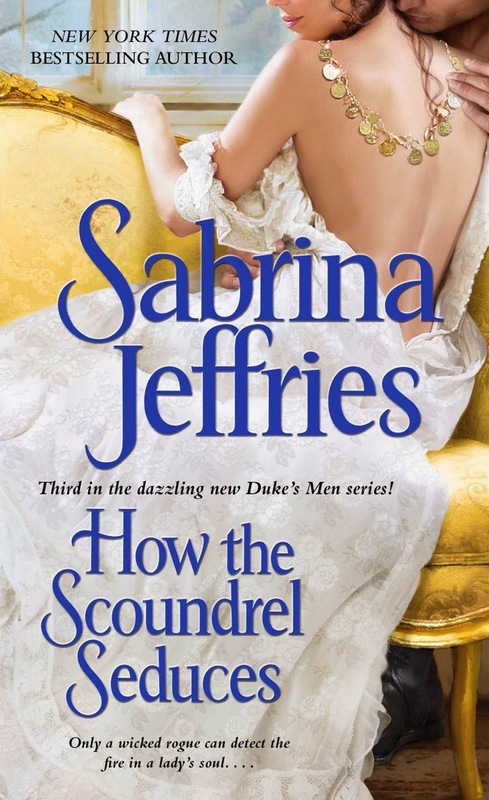 How the Scoundrel Seduces by Sabrina Jeffries is a new romance title from Pocket Books, released August 19 2014 and available from Amazon and Book Depository. Passion was never in the bargain. Addison Reed lost her fiancé, but she’ll do whatever it takes to protect his legacy. When the gorgeous and arrogant landowner, Brazilian billionaire Bruno Duarte, who is thwarting her at every turn, refuses to meet with her, she puts her plan into action. He will listen to her. Bruno’s plan was simple: return to Brazil and marry to fulfill his father’s dying wish. But when his engagement crumbles, and he’s then stranded with an idealistic woman hell-bent on saving a tribe of people on his land, he sees the perfect solution. If his feisty and passionate abductor agrees to a bogus marriage, he’ll relocate the tribe. With the Brazilian heat rivaling the growing heat of their desire, will Bruno and Addison abandon their respective plans and give in to each other, or will their differences tear them apart? Kidnapping the Brazilian Tycoon by Carmen Falcone is a new romance title from Entangled Publishing, released August 18 2014 and available from Amazon.